As we enter 2012, shouldn’t we all be traveling around in flying cars by now? That was the prediction in the Jetsons cartoon tv show. The futuristic series, first produced by Hanna-Barbera in 1962, was set in 2062, exactly 50 years from today. 2012 is the halfway point, so we’ve still got some time before we are all driving around in flying cars. But, many other technology advances from the Jetsons are already with us. The Jetsons was created at a time almost technologically unimaginable today. Television was still partly black and white. The Jetsons was the first program to be broadcast by ABC in color. No personal computers, no cell phones, and of course, no Internet. But, let’s see how well some of the Jetsons vision of the future has worked out so far. The flying car: The design of the Jetsons flying car was inspired by a 1954 Ford concept car, the FX-Atmos, notable for its all-glass bubble canopy, dashboard radar screen and jet-plane-like tail fins. 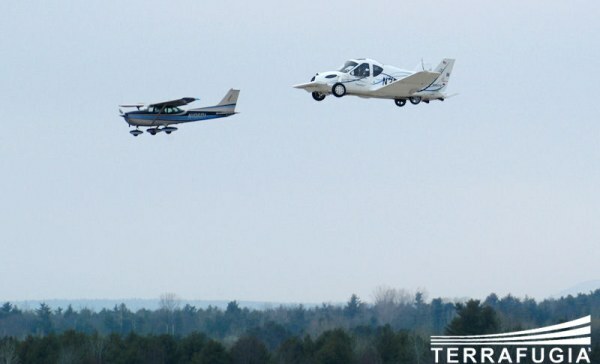 We are not quite there, but the car/plane called Transition, made by Terrafugia, made its debut flight 2 years ago. There have been dozens of other flying cars built, but most people have never seen one overhead. While George Jetson actually drove/flew his car, we do have Google’s self driving car. RUDI, George’s “Referential Universal Digital Indexer” work computer: We have Yahoo, “Yet Another Hierarchical Officious Oracle” and the digital index that is Google. And we also can ask questions and get answers from Siri. Video Chat: George would see and speak with his boss and family from this screen. We have lots of that including Skype video calls, Google+ Hangouts, Cisco TelePresence and many more. The Televiewer: At home, George could read the news off this screen. In the 1960s, this was a strange concept to actually get information off a screen. Now, it’s the primary way. George Jetsons’ 3 hours a day, 3 days a week workweek: Tim Ferris has already achieved that and more with his popular book, The 4-Hour Workweek. George’s job is pushing buttons: In the original 1960s episodes, George’s work involves pushing buttons, knobs, dials, and switches. More episodes were made in the 1980s, and George’s desk was upgraded to flat buttons and brightly lit consoles. While not quite a console, how many of us push buttons on a keyboard all day? Spacely Space Sprockets: Forbes magazine jokingly valued Spacely Sprockets at $1.3 billion, on their “The 25 Largest Fictional Companies” list. Apple’s market cap is around $376 billion today. Robot Vacuum Cleaner: iRobot’s Roomba vacuum cleaner. Rosey, the household robot: TechCrunch wrote about the ReadyBot in 2008, a robot that picks up toys and empties trash. There’s also a slight resemblance to the Anybots robot. Didi, Judy’s digital diary: Judy’s diary was private, so this analogy isn’t perfect, but now Judy might share information about her life on Facebook. There are also many private diary diary applications. Moving walkways: Moving walkways are pretty common at airports, but not as widespread as they were in the Jetsons world. But, this proposed moving Chinese bus that lets traffic pass underneath seems right at home in that world. Mr. Spacely tells George Jetson “You’re Fired”: No need to explain where we’ve all heard that one before. A big part of future technology that the Jetsons totally missed is emailing and texting. Perhaps by 2062 those forms of communication won’t exist. For more, PhoneTVInternet.com has a list of 10 comparisons between the Jetsons and Modern Technology.